The Rhondda Cynon Taf Youth Engagement and Participation Service (YEPS) is committed (that means we’re really going to try) to making sure that young people aged 11 – 25 years old in RCT have a say on things that are important to them. More importantly, we want to make sure that people who make decisions that affect you; such as politicians, schools, and even YEPS, listen to your views and opinions (Article 12). In YEPS, we are trying to educate young people and adults about the United Nations Convention on the Rights of the Child, also known as the UNCRC. This is a really important document that lists 42 different rights that young people aged 0 to 18 years old have. All of our work in YEPS is guided by the UNCRC, meaning that we use it as much as we can when we work with you all, including in after-school activities, extended provision in the evenings, and during accredited courses (like Agored Cymru units). According to the dictionary, a right is: “a belief that is believed to belong to each person”. Basically, it’s something that everyone in the world has from the time they are born to the day that they die that protects them, keeps them safe, and allows them to grow up healthily and happily. All people everywhere have human rights from 18 years old to the day they die. However, children and young people have an extra set of rights from the day they are born until their 18th birthday. This is because children are thought to need extra protection to keep them safe, happy and healthy and to allow them to develop (grow up) to reach their full potential. 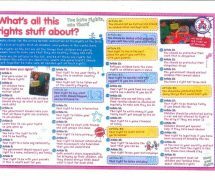 In the UNCRC, rights are called ‘Articles’ and there are 42 of them. Some of the rights in the UNCRC include the right to education (Article 9), the right to healthcare (Article 24), and the right to relax and play (Article 31). What is YEPs doing to make sure all young people know about their rights? 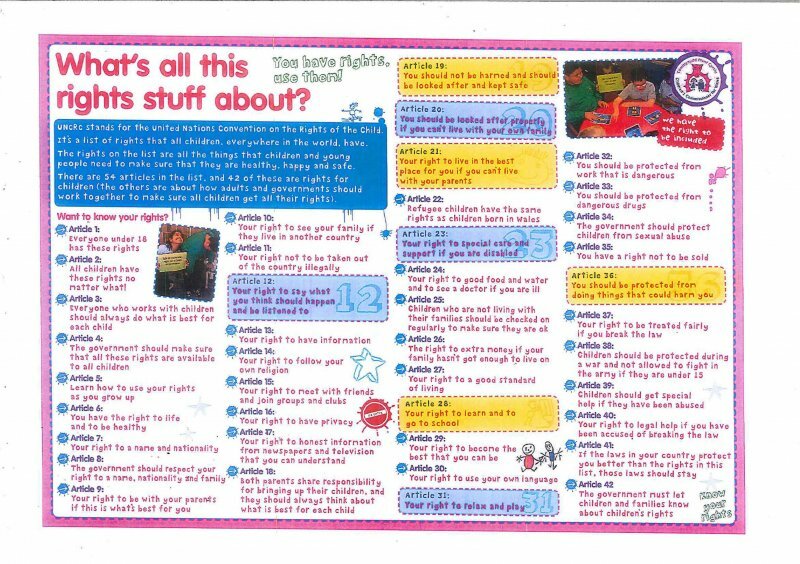 There are loads of articles in the UNCRC that say you have a right to know about your rights, adults should know about your rights (Article 3), professionals who work with you should know about your rights (Article 3), and governments should make sure you know about your rights (Article 42). In YEPs we recently wrote a new Participation Strategy – this is a document that lays out a plan on how we want to work with young people and why – which includes the UNCRC and other Welsh laws and policies including Extending Entitlements, The Well-being of Future Generations Act, the Children and Young Peoples’ Measure, and many more. 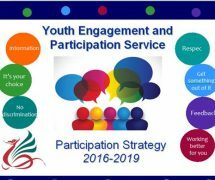 We have tried to make our Participation Strategy young-people friendly so that YOU can measure us against it. You can ask any YEPs member of staff to see the RCT YEPs Participation Strategy and they will give you a copy. How is YEPs measuring its performance? Our Youth Inspection Team uses the NPS when they visit Extended Provisions across RCT (this is Youth Club that runs between 5:00pm and 8:00pm). They then create a report with recommendations on how that club can approve. Since 2014 the Youth Inspection Team has inspected 17 youth provisions and in 2017 they will inspect up to seven more – your club could be one of them – or they will re-inspect clubs to check that they have carried out the recommendations to improve. In 2017 we are looking to recruit up to 10 more young people to join the Youth Inspection Team, it’s free to you and you’ll have all the training and support that you need. If you’re interested or would like more information then please contact Martyn David on: 01443 744260 or e-mail Martyn.David@rctcbc.gov.uk. That’s up to you! We need young people to join our forums! We need you to take part in consultations; this is when we ask you for your opinion on something and send them to decision makers, like if we asked you what you thought about your local sports centre we might then send those comments to the Minister responsible for Sports Centres and the health board. We need you to tell us how to work better for you. How can I join a Youth Forum or ask another question? We’re glad you asked! You can find out more through any of our social media channels which are listed below or you can contact your local Youth Engagement and Progression Officer to find out more about our Youth Forums. Do you have a question about other YEPs work? You can contact us through Social Media or you can speak to the YEPs officer in your school. Alternatively, you can call the Youth Engagement and Participation Service on: 01443 744106.